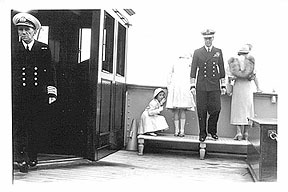 It was near the end of her life that the Empress of Britain touched the high point of her career, when Their Majesties King George VI and Queen Elizabeth sailed from Halifax aboard her at the end of their official Tour of Canada and visit to the United States. 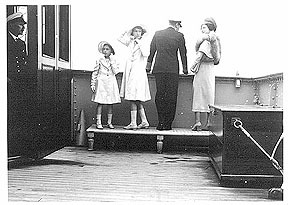 Just before departure King George decided that as she left port the Empress should fly the red ensign instead of the white ensign of the Royal Navy. 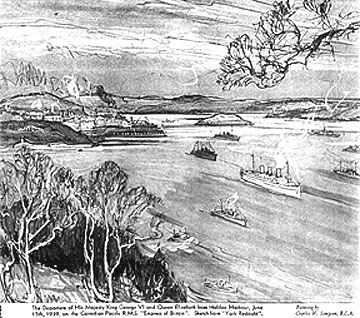 This was regarded as a special honour to the Empress of Britain and to the British Mercantile Marine, as it was the first time that a British sovereign had sailed beneath the famous old "red duster." 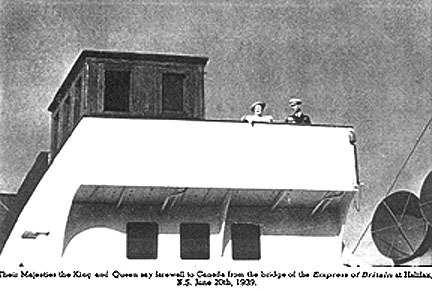 Flags flown by the Empress on that historic occasion were: at the foremasthead, the King's flag as Lord High Admiral; at the mainrnasthead, the Royal Standard; at the main gaff, the Red Ensign; at the bow, the House Flag of the Canadian Pacific Steamships, Ltd.